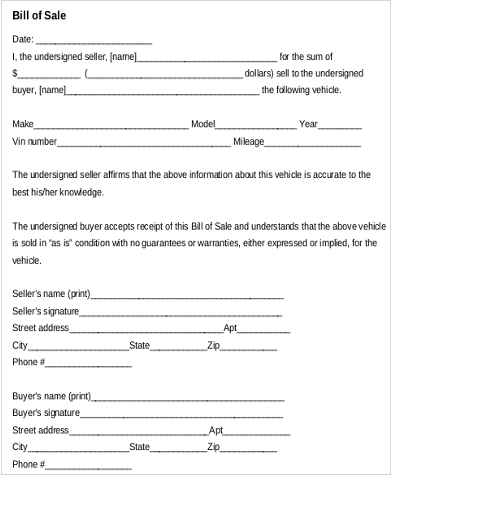 When it comes to buying and selling of cars, bill of sales are deemed to be essential documents. 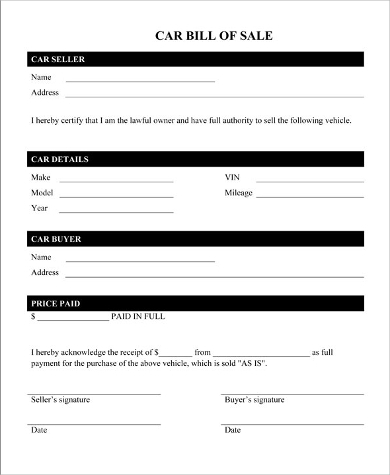 They are the documentation that records both the sale and purchase of the car in one document. If it is notarized by lawyers, it can be seen as a legal document you can use to avoid any hassle and inconvenience for your buyers. The Bill of Sale Samples in this article will help you out when there is a need for you to sell your used cars or if you want to enter the business of buying and selling of cars. You can browse through the six samples we have in this article. What Is Included in a Car Bill of Sale? The following details are included when it comes to Used Car Bill of Sales. 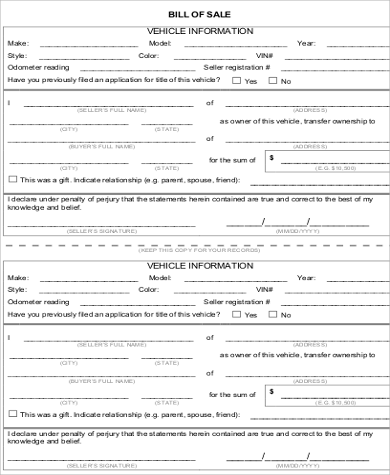 This is where the warrants and guarantees about the car are stated. It can mention that there are no fake airbag covers, no parts have been removed/some parts have been replaced, odometer reading has not been tampered with, and that the buyer now assumes all the responsibility when it comes to the purchased car. This is the statement that mentions that the buyer has the right to sell his vehicle for the selling price and that the seller acknowledges that by paying said amount will transfer the ownership and rights of the vehicle. 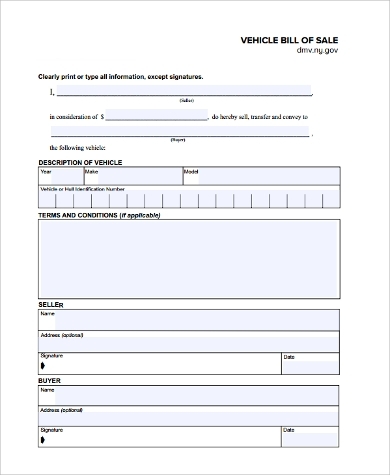 Both the seller and buyer should affix their signature and the date that the document has been signed as a form of agreement and understanding regarding the sale of the item. The sample car bill of sale featured in this article can be used for arrangements that incorporate the sale of cars in different circumstances. These sample templates are available through this article. Downloading your chosen template will be very simple since you will never be diverted to another site. These templates are offered at no cost. You will find that you need not splurge on templates that are high in quality. There are six sample templates that you can choose from. They all come in various designs, layouts, and purposes. These can be downloaded in PDF (.pdf) and Word Document (.doc) files. This makes editing and altering of your chosen template very easy. You can simply change some of the words in the template to match the car sale transaction you have experienced. These documents are likewise lightweight in nature, which means that they won’t take up an excessively large amount of space in your device or PC. Keep in mind that a bill of sale will dependably be handy to have with regards to demonstrating the existence of the transaction. You can make your bill of sale legal by getting it notarized by a lawyer. 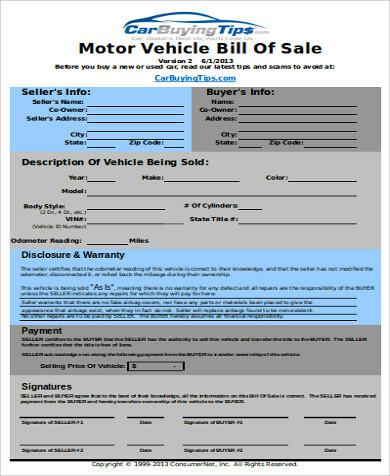 If you are selling your motor vehicle, you might want to take a look at Motor Vehicle Bill of Sale.